Storm RidersReviews and Endorsements"Without sensationalism or self-pity, unsparingly compassionate, Craig Lesley writes of the marginal, the dispossessed, the hardscrabble people of America. He writes with grace and gravity and the driest humor, the quietest passion, the rarest, unjudging justice. This is a beautiful book." 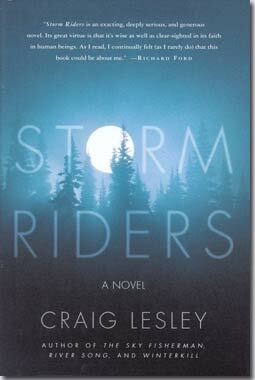 "Storm Riders is an exacting, deeply serious, and generous novel. Its great virtue is that it's wise as well as clear-sighted in its faith in human beings. As I read, I continually felt (as I rarely do) that this book could be about me."